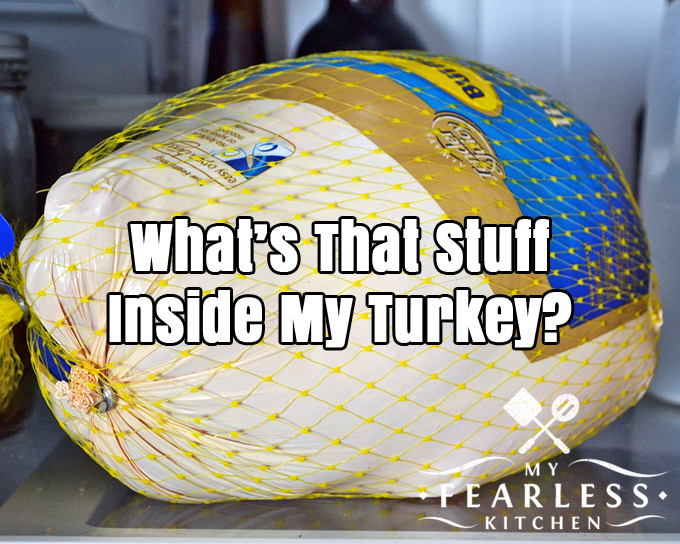 You are here: Home / Kitchen Tips / What’s That Stuff Inside My Turkey? What’s That Stuff Inside My Turkey? One step to never skip when you’re cooking a turkey is to check inside the turkey after thawing it. Do you know what’s inside your turkey and how to use it? Roasting a beautiful turkey can actually be pretty fun! It does take a little bit of planning ahead to get your bird thawed in time, but once that frozen solid turkey is thawed out, the fun part starts! You can’t just unwrap your thawed turkey and toss him in the brine solution. You need to do a little bit of prep work first… you need to get that “stuff” inside your turkey out. Hopefully, if you’ve ever cooked a whole turkey or a whole chicken before, you know that you need to check inside the turkey. It’s sort of like a Mr. Potato Head… there are extra “parts” stored inside! Be sure to check inside the body cavity, near the legs. And here’s a little secret, there’s another hidden compartment! Once you get the stuff out of the back of the turkey, turn him around, lift up the neck skin between the wings, and take out whatever is inside there. The first time I roasted a turkey I forgot to check the front compartment. And I left that paper-wrapped package of giblets inside. Yep. All through the brining and roasting. Luckily, John was the one to carve the turkey and he found it. And I haven’t told anyone who was there that day… until right now! So now that you’ve got all the Mr. Potato Head parts taken out of the turkey, what the heck are they? These parts are called the giblets. There should be four of them, and they each have their own name. In the back compartment of the turkey, you should have found the neck. You may also have found a gravy or sauce packet. Do yourself a favor, and throw that away. Make this giblet gravy instead. (Yes, using the giblets you just “discovered” inside your turkey!) And if you brine your turkey before you roast it, it will be so juicy, you won’t need some weird sauce. Keep these goodies inside a Ziploc bag or a sealed container in your refrigerator. You’ll want them to make giblet gravy! If you’re making soup, the neck is great to toss in your stock pot with the rest of the bones. 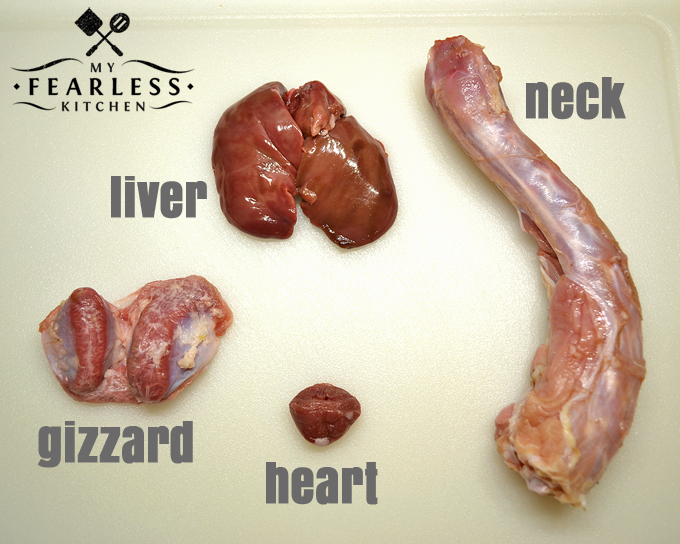 (You can also add the heart and gizzard, but the liver will give too much “liver flavor” to your turkey broth.) I don’t use the liver for anything, so it gets thrown out at my house. Don’t let those Mr. Potato Head pieces inside your turkey scare you! Dig in, roast your perfect turkey, and put the giblets to good use! Do you want even more tips about turkey? Check out these Top 10 Turkey Tips and never be afraid of cooking turkey again! « Is Hand Washing Important?